Let’s all take a moment to observe the pretty cover. The colours, the font, the background… it’s beautiful. I don’t think I’ve seen such a nice one all year. Now I’m not saying it’s the complete and total reason I bought the book… except yeah, I kind of am. So sue me. On her twelfth birthday, Princess Sylviianel is ceremonially bound to her own Pegasus, Ebon. 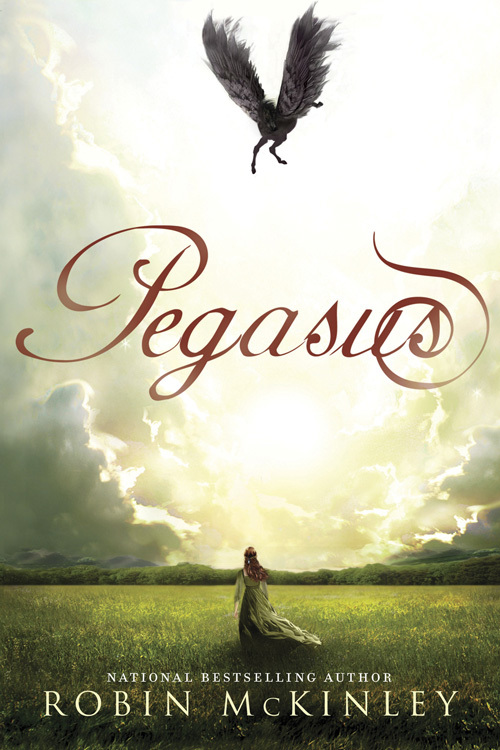 For a thousand years humans and pegasi have lived peacefully in the beautiful green country beyond the wild lands. They rely on human magicians and pegasi shamans as their only means of real communication – but not Sylvi and Ebon. Their friendship is like no other. . . They can understand each other. But as their bond grows more powerful, it becomes dangerous – could their friendship threaten to destroy the peace and safety of their two worlds? I’ve come to the conclusion that it’s possible for one person to have two opinions about one book. The first is formed when you’re actually sat there reading it – you notice the clunky dialogue, awkward phrases and plot holes and it bugs you to form a negative impression. The second opinion comes much later when you’ve finished reading and it’s more about the overall feel of the book. You’ve forgotten about those little niggles and so it’s generally much more favourable. That’s what happened with Pegasus. It felt like I was reading it forever and there were so many little things that irritated me that I half-seriously considered feeding it to my cat and having done with it. It’s a few hours on now and I feel much better disposed to it. Maybe it’s just because I connect it with that beautiful cover, but I’m almost willing to ignore my ranty notes from earlier. I said almost. My main issue was the inherent jumpiness of it. It’s bad enough that Sylvi and Ebon’s mind-speech isn’t distinguished from the normal text in any way, but the narrative meanders all over the place too. So you’ll have the Princess sat in her room talking to Ebon which is basically just normal text phrased in the Second Person, but then she’s suddenly in the past and five minutes later she’s back in her room but musing to herself. It just doesn’t indicate when it’s changed from story to mind-speech to memory. It’s horribly confusing. I know, said Ebon. But after yesterday… if you said you wanted to be empress they’d say, Oh, okay, what do you want your crown to look like? And even if you’d hated everything you saw here and stopped talking to me too… we’d still haul you to the Caves and shove you in, because we promised. There isn’t much of a discernible plot – I think it tries to cover too many different sub-plots instead of focusing on just one. I know there’s a second part to come, but not until 2014 apparently. It’s a shame because I really liked the cliff-hangerish ending and it surprised me a little – it didn’t fit with the rest of the book, but in a good way. It never really decided how it wanted the pegasi to be either. Sometimes they’re treated like honoured guests, others like trusted friends and sometimes like unintelligent pets. This would have been fine if it was trying to make a point about the undecided social status of the pegasi, but I don’t think it was. I liked Ebon mostly, but I expected him to act a little more like an adult. He even calls Sylvi ‘babe’ at one point, to my present and ever-lasting horror. But as I said earlier, I do like it. Now, anyway. I didn’t at the time – in fact I almost considered just stopping reading it. I’m glad I didn’t, but I do think it’s strange how your opinion of a book can change after you’ve taken a step (or an hour) away and looked at the bigger picture. I do want to read the sequel but I hope it’s a little less jumpy and, for God’s sake, use a different font for the mind-speaking. I tried to read Sunshine a couple of years ago and found the exact same thing (although I was far less committed and never finished it…) Miss Leading Lady was locked in a dungeon or something and it was all very exciting until she started talking about cinnamon buns and ruined all the tension! I know exactly what you mean! I had the same thing happen with Hush, Hush, except in the opposite direction. As I read it, I picked up on a few things, but I mostly enjoyed it. A few hours later when I got the reviewing it though, the only things I could remember were the things I didn't like! I ended up giving it 2/5 stars, even though while I read it I really enjoyed it. Funny how the mind works. Anyways, the cover of this one drew me in, but I've seen several people mention that they either were unable to finish it, or suffered through on principle. I doubt I will be reading this, for that reason, which is a shame because the synopsis sounds so promising. @Kelly – Really? Oh that makes me feel a lot better! All the other reviews I've seen adored it, so I was starting to wonder if maybe it was just me. I've done the retrospective enjoyment thing that way round as well, isn't it strange? @Bex – I think Robin McKinley must just be a weird writer. It's very stream of conscious-y and I didn't get along with it. If you gave up on that book, you probably gave up for a reason!